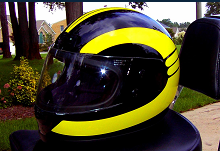 Speed Stripe reflective helmet decals are our largest reflective decal for improved motorcycle safety. While designed for a full helmet, the Speed Stripe reflective helmet decal can easily be trimmed to fit virtually any helmet. This kit comes with an assortment of additional graphic elements that enable this reflective helmet decal to be used in a large number of reflective decal configurations. All of the Reflective Decals provided by StreetGlo are designed for maximum reflectivity. 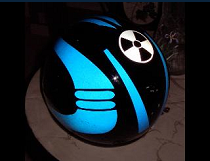 If you want the biggest and brightest reflective helmet decal, Streetglo is your source for the best reflective decals available! Plus many more Reflectie Decal selections to increase your motorcycle safety! Speed Stripes decal kit in Reflective Blue with Radio Active Reflective Helmet Decal accessory on back of helmet. Blue Speed Stripe reflective helmet decal featuring our Radio Active reflective helmet decal as an optional reflective helmet decal. You can combine nearly any of our 4" or smaller reflective helemt decals with the Speed Stripes Reflective Decal Kit. All of the Helmet Decals provided by StreetGlo are designed for maximum reflectivity. If you want the biggest and brightest reflective helmet decals, Streetglo is your source for the best reflective helmet decals! Plus many more Reflective Decal selections for increased motorcycle safety.